In the year 2000 BBC Books, saddled with a Doctor four years into his tenure and carrying a history about him like a tortoise does a shell, took a drastic measure. It made the Eighth Doctor forget who he was, not just for one story, but for a year. Eschewing his companions, temporal knowledge and TARDIS, and for nearly a hundred human years experienced the world and his environment fresh and unaided. This wasn’t the first time such a thing had been done of course – Virgin Books had done a similar thing with the Seventh Doctor in Paul Cornell’s Human Nature; but that story, like every story before it and the ‘Caught on Earth’ cycle, returned the Doctor to his present history-steeped, continuity sodden ‘familiar self’. Of course, what Richards needed, most likely wanted to do that no story before had been able to do, and what he could never hope to achieve, was not making the Doctor forget who he was, but his audience. Five years later the idea would seem moot, because now most sensibly, Doctor Who is made for a new audience, not a curmudgeonly and shrinking fan base tied to the old series and its continuity. Played from the outset very smartly, with few instances of a ‘restart’ button having been pressed, and (thankfully) no strange desires to make the Doctor half-human, the Eccleston series has been a smash hit. The issue at the end of his supposed first season? The short televised life of the Ninth Doctor, gazumphed in a BBC plot (sort of). With that in mind, and the how’s return neatly assured, the real gambit would surely be the first regeneration – hardly the surprise that it was in 1966, but still an effective show changer. The Tenth Doctor, therefore, is RTD’s newest gamble, and The Christmas Invasion saw him arrive in style. David Tennant – young actor, a board-treader recently tested with some RTD-produced top shelf BBC fare. But what of the new Doctor himself? The Christmas Invasion, whatever individual fans may review it as, is a master-stroke, and it’s all in the imagery. Blood, shades of the occult, lots of shouting and visceral reds courtesy of the Sycorax, tribal paraphernalia recalling some aspects of the Lord of the Rings movies, and then there’s the Doctor himself. It may well be that in this story the quintessential image of Tennant’s Doctor – of any Doctor for the new century, has been achieved. And this may be a scary thought if we’ve peaked this early. Nevertheless, can there be a more Doctorish image than that of our hero wielding a sword high above London in his pyjamas? It’s both sublime and ridiculous, projecting bravado and peril as well as delivering a knowing nod to the British tele-fantasy heroes of old as well as those more recent – Arthur Dent’s dressing gown, Harry Potter’s sword. It’s also a neat reflection of Davison’s Doctor’s first moments in Castrovalva; incapacitated, rendered all but useless while some greater peril gathers strength about him. In all its vulnerability its also a symbol of confidence – the polar opposite of Tennant’s predecessor with his tough leather-clad and cropped hair exterior but soft, guilt-ridden centre. 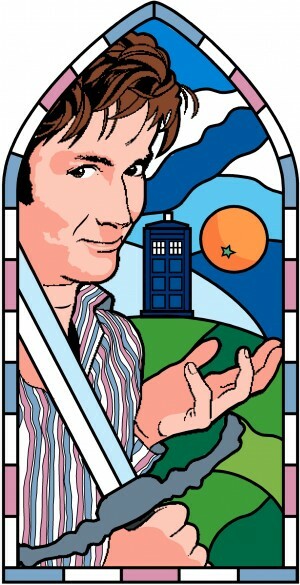 Indeed, if rumour is to be believed, that this season’s theme is of the new Doctor’s over-extended confidence and perilous self-assuredness, then its initial story neatly galvanises both ideas – of the handing down of some very British hero archetypes with an internal motif being developed. What to make of the Satsuma? Is it the ‘Torchwood’ of the new series, appearing as it does in two stories to date (if you care to include Attack of the Graske)? Probably not. This entry was posted on Monday, November 18th, 2013 at 4:30 pm	and is filed under Issue 1, ZEUS PLUG. You can follow any responses to this entry through the RSS 2.0 feed. You can skip to the end and leave a response. Pinging is currently not allowed.